They call it the Valley of Wine and Roses. Nestled between the Langeberg and Riviersonderend Mountain ranges, where the Breede River flows, the Robertson Wine Valley is a cornucopia of things to see, do, taste and smell. Merely 90 minutes from Cape Town along Route 62, it offers so much variety that several volumes of print would be required to do justice to it all. Here we offer a sample of what you can expect. There is a trick to striking the right balance between heritage and luxury, but it seems that venues in and around Robertson succeed in doing just that. Tucked away off the road to Swellendam, Jan Harmsgat is a beautiful old farm (established 1723) preserves a living link with the past, offering a wonderful mix of understated old world elegance with all the mod cons, bells and whistles. A former slave lodge and stable houses four bedrooms with unbelievably comfortable beds and luxurious Victorian baths. Charming details such as the personalized welcome letter and tiny exquisite roses on the bath mat enhance the experience. The central lounge area gives the feeling of a home away from home, making you feel like old family friend rather than a paying guest. Pomegranate martinis around a fire served with delicious pecan nuts picked that morning from well-laden nut trees make for a very convivial way to meet fellow guests. Dinner is a sumptuous experience. Regale yourself at a long table in a dining room warmed by a crackling fire, with food prepared by new executive chef Tronette Dippenaar of Lord Milner fame, whose creations are renowned for combining traditional South African fare with a modern twist. Meals are paired with delectable Jan Harmsgat wines from single block vineyards to ensure a unique gastronomic experience. In the morning, shake off the cobwebs and have breakfast on the mountain after a guided tour of the farm by open topped Land Rover. As the sun breaks through the mist veiling the ancient hills, golden-maned wildebeest graze and dew-covered spiderwebs sparkle in the morning light. It’s like being present at the first morning of the world. A similar sense of wonder is inspired by the simple experience of waking up in a king-size bed to the liquid notes of birdsong filtering through the trees. Although the Robertson Small Hotel is located in the heart of Robertson itself, it feels more like being in a tranquil haven far removed from the cares of the world. The simple but contemporary architecture of this quaint but chic ten-room boutique hotel is an aesthetic experience in itself, but the real art is on the menu at the hotel’s signature restaurant, Reuben’s at the Robertson. With a choice of recipes by well known chef Reuben Riffel and an exclusive wine collection, you can expect an unforgettable experience. For the ultimate combination of natural beauty and home comfort, look no further than Mo and Rose, located just outside of Robertson in scenic Klaasvoogds West, in full view of the majestic Langeberg mountains. The Wine Bistro is a beautifully converted old barn with charming rustic furniture and a simple but sophisticated menu. Dishes are seasonal, incorporating fresh local produce; most of the vegetables and herbs are home grown. A stellar wine list makes every meal a voyage of discovery. A special feature of Mo and Rose is the way that the boutique guest house succeeds in bringing the outside nature in. Six contemporary en-suite bedrooms in a former farmhouse have private patios giving onto a magical cactus garden teeming with bird life. A historical cottage has two rooms on two levels in a maisonette style. Said to be the longest wine route in the world, the Robertson Wine Valley boasts wines so various and palatable that you’ll wish you had all the time in the world to experience them all. A good place to start is the Robertson Winery itself. 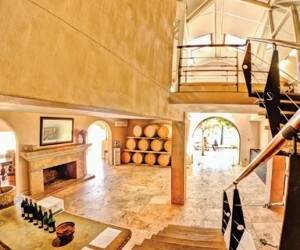 It’s the biggest wine co-op in South Africa, with 35 families producing a full range of award-winning cultivars: sparkling wine, Sauvignon Blanc, Chenin blanc, Chardonnay (wooded), Gewürztraminer, Viognier, Rosé, Special Late Harvest, Noble Late Harvest, Muscadel, Pinot Noir, Merlot, Cabernet Sauvignon, Shiraz, Pinotage, Red Blends, Port… Accolades include numerous awards, including gold at the Chardonnay Du Monde for the 2013 Constitution Road Chardonnay. A truly delectable experience offered by the Robertson Winery is a chocolate and food pairing demonstration, although it might be more accurate to speak of an alchemical transformation. Not only is it a chance to taste wines exclusively available at the winery, it is an occasion to learn about how the right chocolate can turn a great wine into something out of this world. Of course it helps when the chocolates are hand made exclusively for Robertson Winery according to specifications of the Robertson Winery’s expert wine makers. The combinations are the fresh citrus and lime aromas of Kings River Chardonnay with white chocolate and lemon; the currant and cherry notes of Prospect Hill Cabernet Sauvignon with black currant chocolate; the banana, chocolate, plum and mocha aromas of Phantom Ridge Pinotage with dark mocha chocolate with a milk chocolate centre; spicy Wolfkloof Shiraz with pepper-covered dark chocolate; and the rose petals and exotic fruits of the Robertson Winery’s Gewürztraminer with Turkish Delight dipped in milk chocolate. If you’re looking for more substantial food than chocolate, there is no shortage of establishments that offer fantastic pairings of wine, meat and other food, always in settings steeped in character. Springfield Estate, home of the famous Life From Stone brand, is perfectly set up to satisfy the most demanding gourmand. The wines are made according to ancient tradition — most are fermented with natural wild yeasts occurring on the grape skins. This is a risky approach that sometimes leads to vintages being lost, but the results are exceptional. But you don’t have to be a gourmand to enjoy yourself at Springfield Estate. It’s an exceptionally child friendly venue, with plenty of space for restless legs to run around. Not only that, but families are welcome to have their own picnics on the lawns — quite a rarity when so many places charge for the privilege! As with so many places in Robertson, of course, Springfield Estate also offers a feast for the eyes, with a wooden deck overlooking a crystal clear dam, where children can row boats, with the distant mountains looming beyond. On the road from Robertson to Bonnievale lies the Van Loveren Estate, where the Christina’s@Van Loveren bistro offers a wide range of food and wine pairings, where you can really get to grips with the nuances of a full range of reds, whites and Methode Cap Classique in combination with cheese, chocolate, nuts and charcuterie. There are children’s and non alcoholic options too. Afterwards, it’s rewarding to take a guided tour of the many trees surrounding the farm buildings. Planted by Jean Retief, wife of Hennie Retief Snr, who planted the first vineyards in 1937, each tree commemorates a special event in the history of the family or South Africa. There is, of course, more to Robertson than wine alone. A visit to the family-run boutique Marbrin Olive Farm is sure to broaden your horizons. For a start, you can learn what real fresh top quality olive oil tastes like. Most of the olive oil available in supermarkets is actually substandard surplus muck from Europe, as far from “extra virgin” as a mule is from a thoroughbred stallion. At Marbrin, however, Pieter Coetsee and his son-in-law Clive have learned the subtle art of making olive oil the proper way. The olives are hand picked — for better quality and to provide local employment — then soaked in a pure brine solution for six to eight months so that they lose their bitter turpentine taste and turn into something absolutely delicious. Marbrin won Gold at the 2011 SA Olive Awards with their first blend, going on to win two golds and a silver in 2012 and three golds in 2013. 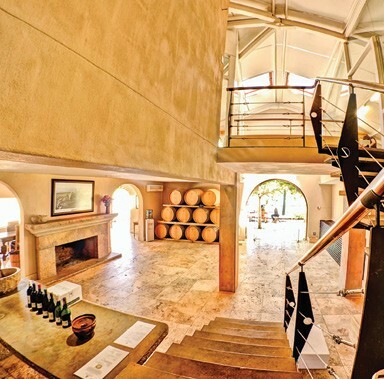 Tastings include a tour raound the olive farm, trying different cultivars of oil from tanks, sampling different blends of oils, as well as oils pressed from olives harvested at different harvest times. Table olives, pastes and tapenadas are also available to taste.